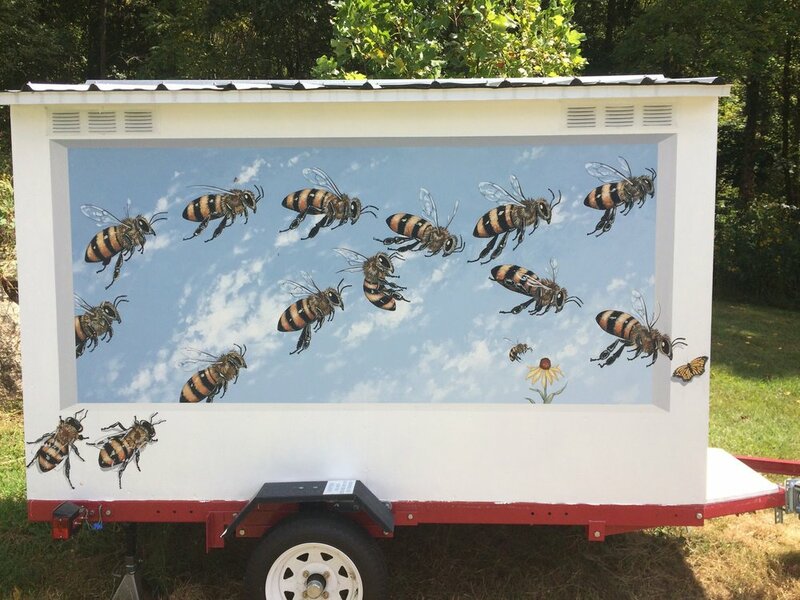 When Bee Healing Guild founder Lady Spirit Moon approached me about adorning the exterior of her "Bee Bed" as part of The Good of the Hive, it was easy to say yes. The work that Lady has put in over the years for the bees as a teacher to so many made this an easy decision. 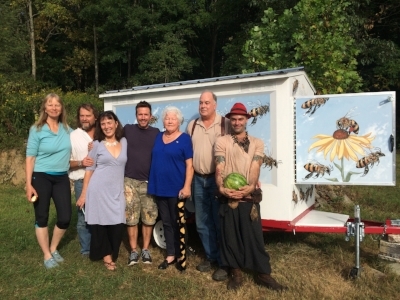 Lady owns and operates BEe Healing Apiary in Spring Creek Community of Hot Springs, NC. She is a master apitherapist and has been raising resistant stock bees using the BEe Perspective, no-treatment method since 2008. She has never treated and rarely uses smoke. Lady also founded The Gathering which The Good of the Hive had the opportunity to present at in September of 2016. If you want to learn more than you ever thought possible about what is going on with the bees anbd how to help, attend the 2017 Gathering. Click here to learn more. Lady Spirit Moon is one very special woman on the planet and I feel blessed to have had the opportunity to get to know her and spend time with her on her front porch. The Bee Bed is a small space designed for a person to climb in and relax or meditate with the smell, sound and vibration of an actual bee hive. There is a live bee hive in the back of the structure. The bees are kept separate with a screen, but the sensation is that you are within the hive. I was in it for a little while and it was quite wonderful! You can learn more about Lady, the BEe Healing Guild and the Bee Bed on her website.